THE Winter edition of Windsock -the very last one- concludes Harry Woodman's popular scratch-building series with nine packed pages covering finishing,airbrushing,weathering,markings,white metal and photo-etch details: sketches ,model and rare archive photos predominate to provide a fitting finale to the late master modeller's exemplary contributions to our hobby. 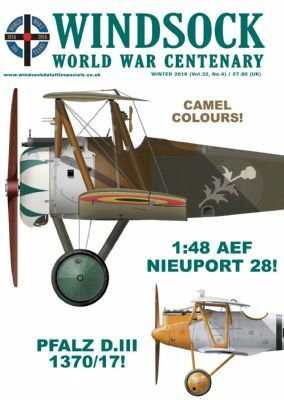 Greg Van Wyngarden returns to the ever-evolving colours of Pfalz D.III 1370/17 which was one of the lead features in our very first Windsock issue published in 1985-rare photos and new Ronny Bar artwork add gravitas to this new take on an old favourite. Completely new and extended study of the classic biplane , one of the most aesthetically pleasing of all the many German fighters used operationally in WWI. Includes extra colour profiles and manufacturer's sketches.